How do I disable my the setting makes my computer ring 1 minute after every phone call I receive? Same here with MBPr (OS X 10.11.5 or older) and Nexus 5X. This is very annoying and does not shut up for minutes and disregards any attempt to mute or close the notification. Hey Guys, you may turn off the notification sound in Settings. 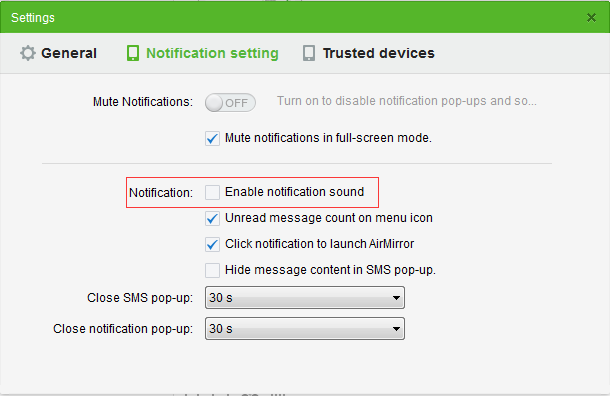 Open AirDroid on your Mac>> Settings>> Notification setting>>Enable notification sound>> Untick the box next to it. Kindly note that turning off that setting, also disables the sound of messages and other apps' notifications.